Roulette is one of those casino table games that seems to always have a following no matter how long it stays around. There are four main types of roulette available in the online environment, and we want to show you what you need to know about each of them including which games have the best payout rates. We’ll also point out anything in particular about each type of game that you might need to know. Consider this your guide to roulette as a whole and a guide towards choosing which of the games to play. First and foremost, we have mini roulette. This is a game that is primarily found on the Internet only, and we don’t know if it’s found much at all in land-based casinos. The key features of this game include a single zero and the use of the numbers one through 12 only. While you might think that this is a good game to play because of the single zero, you would be mistaken. In fact, the house advantage in this particular game is worse than any other roulette game out there. It would be the same as playing a normal 1-36 game with three green zeroes which is terrible. American roulette is another popular game, though it’s different in that you will definitely find it in land-based casinos. You can tell that you’re playing American roulette with the two green zeros (0 and 00) and the numbers 1-36 on the table. While this game has a better payout rate than mini roulette, it’s still not the best option for play, and it should also be avoided as much as possible. With that having been said, it’s a good game for roulette tournaments if you aren’t playing against the house because the extra green zero offers chances for innovation in the tournament format. Finally we have European roulette and French roulette which are typically the same game. 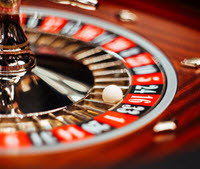 The only difference is that some French roulette games will have some extra rules that make even money bets slightly better for the players, but this is a minor change. Each of these games will have the same layout with a single green zero and the numbers 1 through 36. The house advantage is less than three percent which is on par with what a lot of players achieve in skill-influenced games like blackjack and video poker.